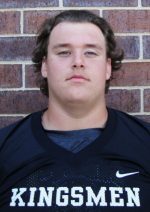 Penn Senior Ty McCaskill, a 6-foot-5 inch, 300-pound offensive tackle, has been selected to play in the Blue-Grey game in Dallas, Texas, on Monday, Dec. 18. The game will be played at AT&T Stadium, which is the home field of the Dallas Cowboys. Kickoff is set for 7 p.m. ET. McCaskill was part of the Gold Rush offense for the Kingsmen that took Penn to two state championship appearances (2015 and 2017). To see Ty McCaskill represent the Kingsmen football team in the Blue-Grey game, you can stream it on ESPN 3.